Fake Money Used In Which Movie Was So Realistic It Led To A Real Counterfeiting Investigation? Which Operating System Bestows Animal Code Names On All Releases? It’s a fine line to walk in producing a movie: you want to create a realistic cinema experience for movie goers, but you don’t want to end up so realistic you run afoul of the law. The cocaine is supposed to be fake, the bullets blanks, and the money, well, funny. In the case of the 2001 action film Rush Hour 2, however, the funny money wasn’t so funny. Prop company ISS did such an excellent job creating fake money for the scene at the end of the film, where over a hundred million dollars rains down onto the street, that movie extras and pedestrians alike walked off with the fake money and attempted to spend it. 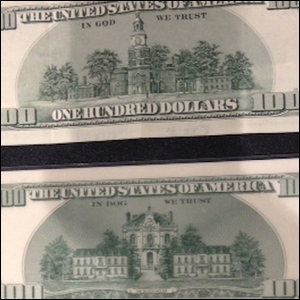 Although the fake hundred dollar bills weren’t direct replicas, the backs, shown here, clearly have differences (like a different estate pictured and “In Dog We Trust” instead of “In God We Trust”). So many of the fake ISS bills ended up in circulation that, ironically, the Secret Service was called in to investigate the prop money (and potential fraud) created by a movie about Secret Service investigation of counterfeit money (a central component of the Rush Hour 2 plot). While no prop makers were charged with counterfeiting, the Secret Service did demand the destruction of billions of dollars worth of fake movie money (at a very high real-world cost to the prop companies). Now most prop companies stay within the framework of currency-protection laws by printing stacks of blank bills and banding them with real money on top to keep accusations of counterfeiting at bay.